At present the Fair Rubber Association is cooperating with the following suppliers of Fairly Traded natural rubber: Frocester, a plantation in Sri Lanka and the first partner (products sourced from this supply chain include i.a. sneakers and hot water bottles), New Ambadi, a plantation in South India (i.a. 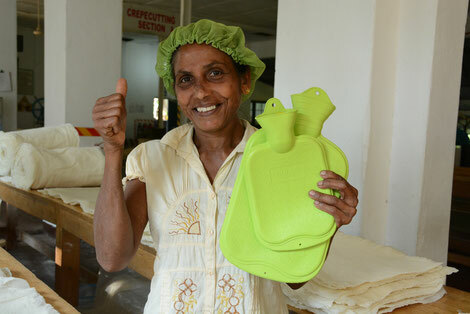 mattresses and condoms), Lalan Rubbers Ltd., a group of plantations in Sri Lanka (i.a. household gloves and mattresses) and the Green Net Cooperative, Thailand, an association of small coconut and rubber farmers (i.a. flip flops). Fair Rubber is open for cooperation with new producer partners, provided that such an expansion of the supplier base is justified by a matching demand for products made with Fairly Traded natural rubber products. The Frocester plantation is part of the Horana group. It is located in the hilly south of Sri Lanka, about 11Km or 7 miles from the Horana town. 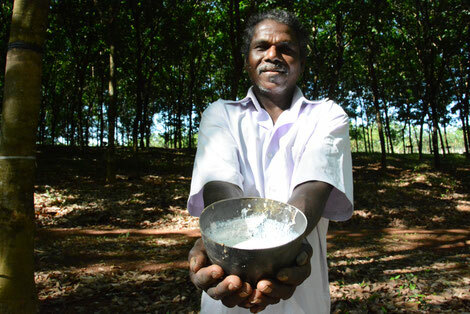 The Estate primarily grows rubber, while cinnamon is also cultivated on a smaller scale. The Frocester estate contains also a factory to manufacturer rubber into Sole Crepes. About 400 people work on the plantation. Most employees live in houses on the plantation. From the Frocester plantation, Fair Rubber is sourced for sneakers and hot water bottles. The Fair Trade premiums have made possible several water tanks, the construction of a training centre and a bridge, connecting several parts of the estate with the next town (school, hospital). 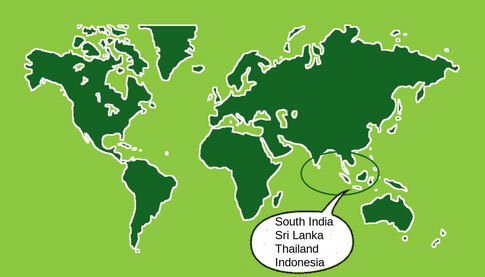 Lalan Rubbers Ltd. comprises 13 plantations in various regions of Sri Lanka. Lalan’s participation in Fair Trade predates the founding of the Fair Rubber Association - and today Lalan is one of the premier supplier partners for members of the Fair Rubber Association. Amongst others, natural rubber from Lalan is used in household- and gardening gloves, elastic bands, balloons, and mattresses. Unfortunately this latter supply chain was interrupted for some time, as an accidental fire destroyed the mattress factory. By now a completely new production line has been installed – and hence Fair Trade premiums are flowing again, too. The joint bodies have used this money to improve drinking water systems for hundreds of families, purchase playground equipment, and make a bridge which had been damaged by a truck fit for purpose again. The New Ambadi Plantation is located at the in the extreme South of India, very close to Cape Kanyakumari. By rubber standards New Ambadi is small – ca. 170 workers ad their families – but special in a number of ways: Its on site centrifuge unit focuses on high quality liquid latex, which is sought after by condom manufacturers, but also is used in mattresses and other applications. 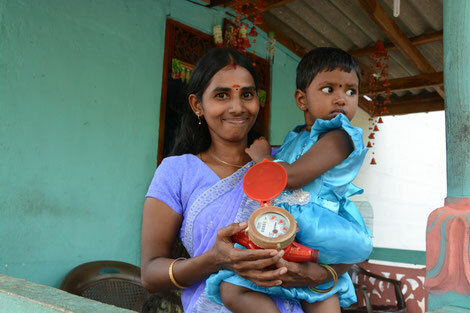 It is also a pioneer partner in Fair Trade – being one of the first to sign up to the concept. No wonder, as its management company has a reputation for high corporate social standards. The free plantation hospital e.g. caters for all surrounding villagers, too. In its use of Fair Trade premiums New Ambadi broke new ground, too, the joint body installed the first ever supplementary pension fund for rubber workers anywhere in the world. The Green Net Cooperative (GNC) is a registered is a registered “Service Cooperative” under the Ministry of Agriculture and Agricultural Cooperative since 1993. GNC is a social enterprise working to promote organic farming and fair trade. 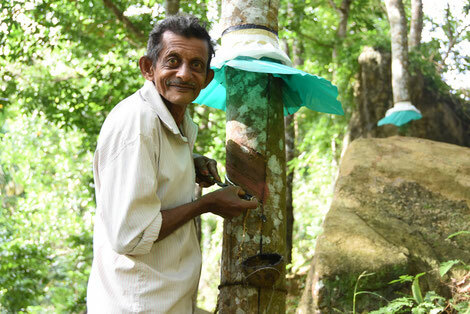 66 of its farmer members are certified organic for coconuts – and now rubber as well. 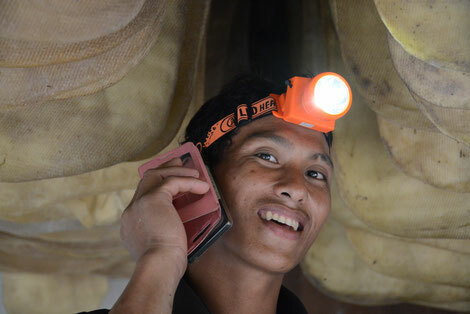 Of special importance from a Fair Trade perspective: The farmers will share any Fair Trade benefits from the Fair Trade premium with the people who do the tapping – often migrant workers (see picture: Tapping is done at night/early in the morning, when it is cool: as soon as the sun comes up the latex milk coagulates too quickly). The rubber from Green Net will go into flip flops. This association has some 400 members, who all supply their raw material to Associated Speciality Rubbers (ASR), where the natural rubber is either made into all kinds of dry rubber qualities, or into centrifuged (liquid) rubber. ASR is an unusual processor, as they have tried to give their small holder suppliers a better price – but market pressures make that impossible. It is hoped that the Fair Trade premium paid by Fair Rubber Association logo users can fill the gap. The Annual General Meeting annually elects a committee: all of the 20 ASR latex collection centres have to be represented by at least one person, and/or one representative for every 15 farmers. Members pay a small monthly fee, but in turn get a free food packet at X-Mas from ASR which is worth more than the membership fee. If Fair Trade sales pick up, it is hoped that another 400 small farmers supplying ASR (but not members of the Association yet) will join.